Edensor Church, designed by Sir George Gilbert Scott and completed in 1867, replaced an ancient structure. The earliest mention of it was in an undated deed made in the time of William Earl of Derby who lived in the reign of King Henry II, so in a document written between 1216 and 1272. 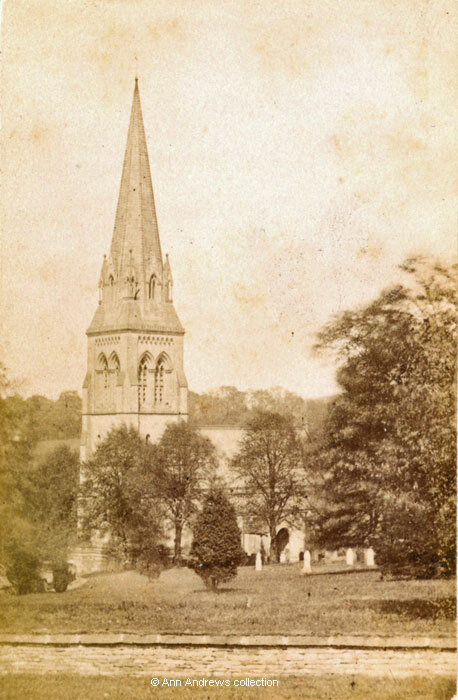 The top photograph of St. Peter's Church is from a carte de visite that was taken by the Matlock Bath photographer William Potter, probably in the 1890s. One's eye is immediately drawn to the distinctive broached spire on top of the tower at the west end of the church. The spire itself is octagonal and made up of eight triangular faces (broaches). When Sir Joseph Paxton was buried in the churchyard in 1865 "The Derby Mercury" reported that the "The ancient church, long crumbling under the weight of years, was removed about a year ago, and the new edifice which the present Duke of Devonshire is about to erect at a cost of about 10,000li [£10,000] is just rising above the foundations". Sir Joseph Paxton, M.P. Died June 8, 1865, in the sixty second year of his age. The church is Victorian Gothic, in the Decorated style. Many pieces from the old church were preserved in the new building and included a brass plate, written in Latin, dedicated to John Beton who had served Mary Queen of Scots. He'd been employed as Taster and then as Comptroller of the Household. "In conjunction with others he bravely liberated the most Serene Queen from the chains of a most truculent tyrant at the castle of Loch Leven". In the north aisle is a large monument to two of Bess of Hardwick's sons, Henry (d.1616) and William (d.1625) Cavendish, and a window in the eastern chapel dedicated to Lord Frederick Cavendish who was murdered in Phoenix Park, Dublin, in 1882. Kathleen Cavendish ("Kick", nee Kennedy), widow of the Marquess of Hartington who was killed in 1944, was buried at Edensor and, more recently, Andrew, 11th Duke of Devonshire, was interred at St. Peter's in 2004. Born May 21, 1790. Died 18 January, 1858. 1. 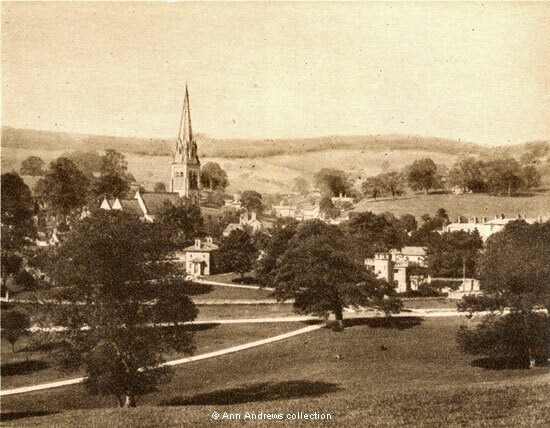 [Edensor Church] Photograph W. Potter, Matlock. Copyright. The CDV is an albumen print mounted on a small card measuring 6.3cm x 10.4cm. 2. "Edensor, The Graceful Spire". Sepia image from Mee who acknowledges the work of his Art Editor, Sidney Tranter, but is not specific about who provided which picture, although contributors included the National Trust and Valentine and Sons. 3. Engraving from a sketch by Llewellyn Jewitt, published first in Vol. 1 of "The Reliquary" (1860-61) and then in "Black's Guide to Derbyshire" (1888). Cox, J Charles (1877) "Notes on the Churches of Derbyshire, Vol 2, Hundred of the High Peak and Hundred of Wirksworth", Chesterfield: Palmer and Edmunds, London: Bemrose and Sons, 10 Paternoster Buildings; and Derby. Cox translated the Latin inscription of the Beton memorial plate. "The Derby Mercury", 21 June 1865. 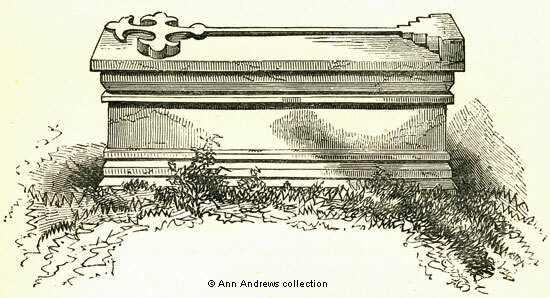 Burial of Sir Joseph Paxton. Devonshire, Deborah (2010) "Wait for Me" published by John Murray. ISBN (of paperback) 978-1-84854-191-7.